Responsive Output You do not need to turn responsive output on or off in Side or Top Navigation, because it is always enabled for those skins, which is not the case for Tripane skins. However, there are some additional settings you can provide for responsive output on the Skin tab of the Target Editor. 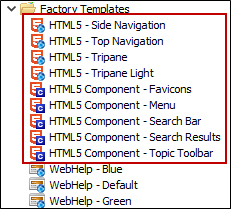 Different Styles Because the Side and Top Navigation skins have fewer elements in them, there are fewer fields in the Styles tab of the Skin Editor than there are for Tripane skins. Also, there are some styles for menus that are unique in each type of skin. See HTML5 Skin Styles. UI Text Fields With fewer elements involved in Side and Top Navigation, there are fewer fields to be concerned about in the UI Text tab. Tripane skins have more UI Text fields. See Changing Text Strings in HTML5 Skins. 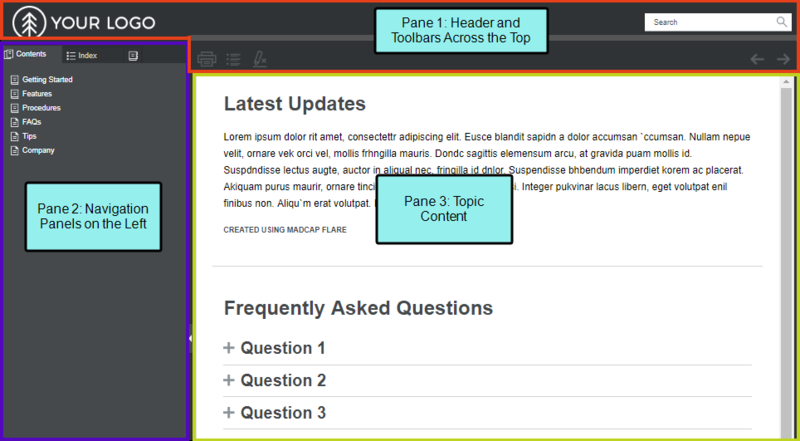 Project Merging The Side and Top Navigation skins do not support project merging, whereas Tripane does. Better Search Engine Optimization Side or Top Navigation means better search engine optimization (SEO). This is thanks in part to the absence of iframes. In addition, the output is not dynamically loaded in div tags, but rather the content is flattened, which makes it easier for web crawlers to locate. 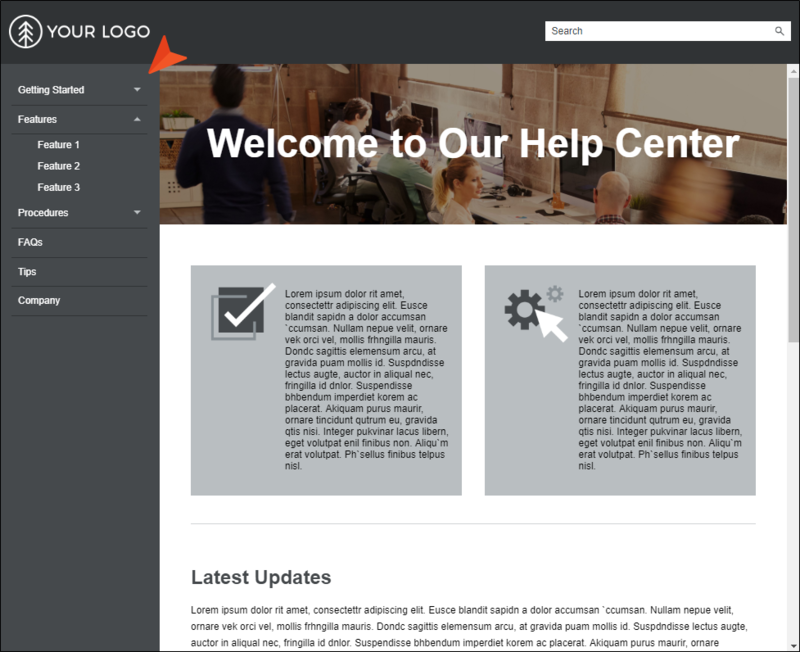 Navigation Displays with External Search Results Side or Top Navigation provides a better experience with external searches and navigation. 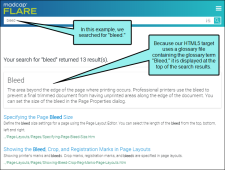 For example, if you have Tripane output and click on a Google search result for a specific page, that page opens without the surrounding navigation (e.g., TOC) included in that Help system. But with Side or Top Navigation output, that same page would display with its intended navigation. 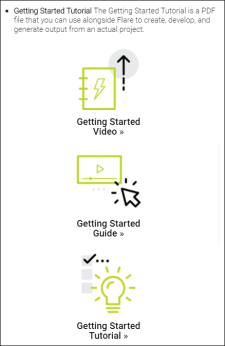 Improved Scrolling and Zoom in Mobile Devices When Side or Top Navigation output is viewed on a mobile device, scrolling and zoom features are typically better than they are for Tripane output. 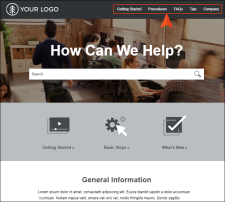 A Home topic is often used in HTML5 outputs. However, for Side and Top Navigation outputs, you usually do not add this topic to your TOC (whereas you do add it to the TOC when creating the older Tripane output). 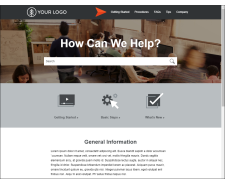 Instead, it is standard practice to link to this page from the logo you provide in your Side or Top Navigation skin. 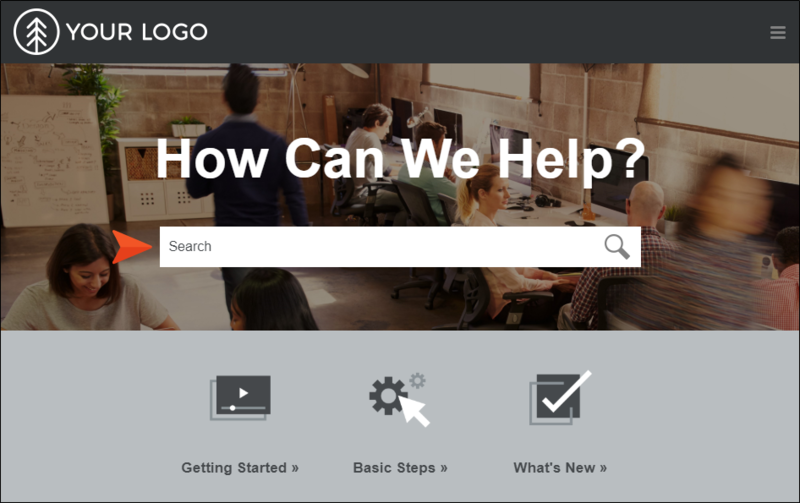 A Home topic is the one that you specify as the startup topic in the Target Editor. Unique Search Bar The Side and Top Navigation skins are designed to show a search bar at the top of all topics. However, you might want to emphasize the search bar on your Home page, especially since search is the most popular and effective way to find specific information. Then you can insert your own Search Bar proxy in a more prominent place in the Home topic. See Skin Components and Proxies. Unique Hero Image One easy way to make a Home page stand out from the other topics is to place a background image (or watermark) on it. 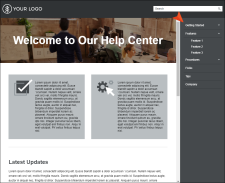 In the world of web design, this is often referred to as a “hero image.” You can set a background image in a stylesheet. It is recommended that you use a hero image that is quite wide. 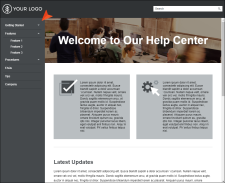 In the Flare Top Navigation project templates, this image has a width of 1903 pixels. 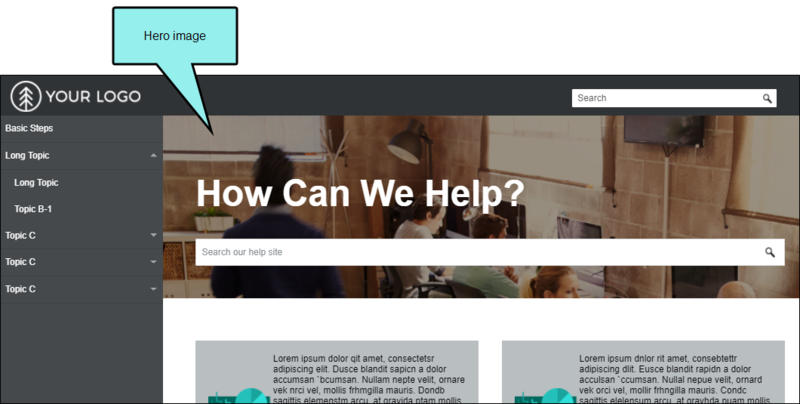 In Flare’s Side Navigation project templates, this image is 3456 pixels wide. A big hero image helps to account for even the largest of monitors. See Creating Watermarks. Unique Master Page By using one master page for your Home topic and another for the rest of your topics, it is easier to give them different looks, as well as different headers and footers. 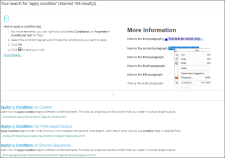 See Creating Master Pages. 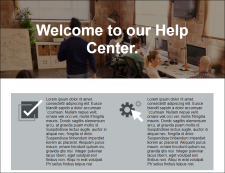 For an example of how you might make a Home page unique, see Side Navigation Conversion Tutorial or Top Navigation Conversion Tutorial. 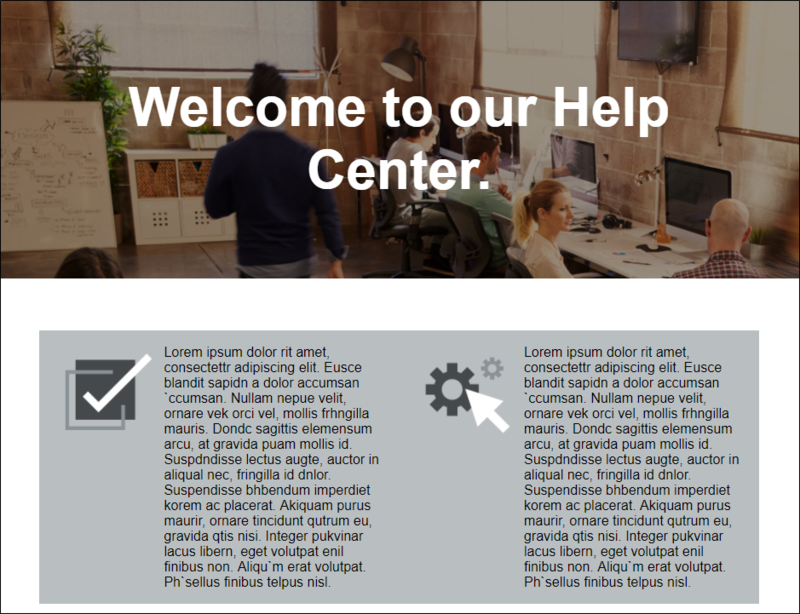 Let's say you create HTML5 Top Navigation output. When viewed on a large screen, menus appear at the top. These are populated from your TOC file. 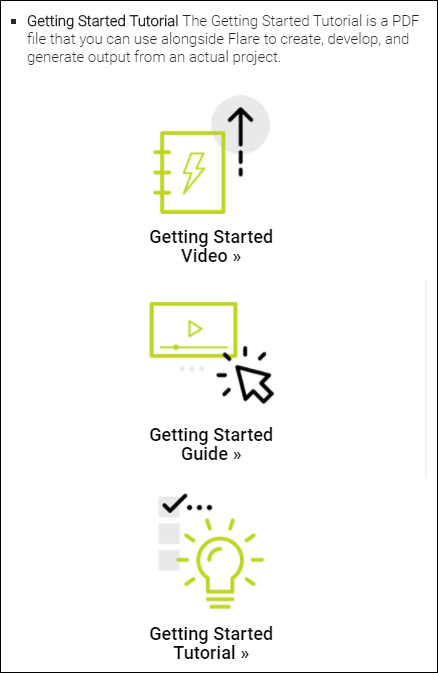 But when you open the same output on a tablet device, you notice the top menus are no longer there. 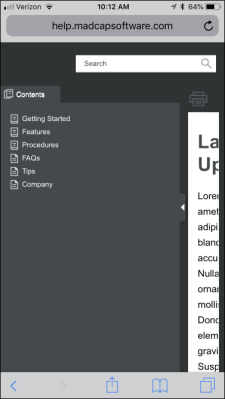 Because of the smaller screen they are placed in a flyout menu in the upper-right corner. Let's say you want to create HTML5 Tripane output from your project and provide it to people using both large desktops and small mobile devices. Without using responsive output, you would need to create two targets and two skins, and perhaps separate settings elsewhere (e.g., stylesheet mediums). If you do not create a separate target and skin for the mobile output, but instead direct people to open the full output on their smart phones, it can be difficult (if not impossible) to navigate through that output on a smart phone. 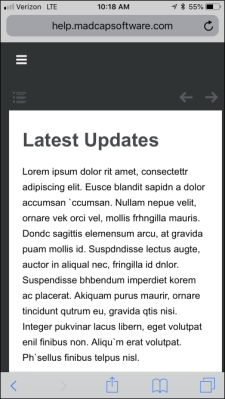 So instead, you enable responsive output in the HTML5 Tripane skin. 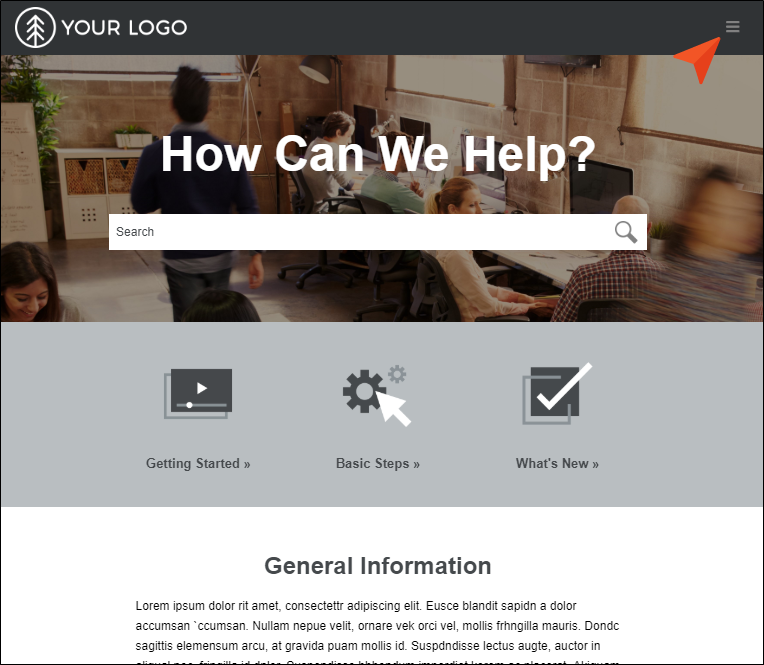 When finished, you direct end users to open the same HTML5 output, regardless of their browser or device. On a smart phone, the skin is adjusted automatically. In the end, you accomplished essentially the same thing that you did with two targets and two skins, but you did it with only one target and skin. For HTML5 targets, you can choose the type of search engine you want people to use—MadCap Search, Google Search, or Elasticsearch (for Side Navigation, Top Navigation, or skinless output). 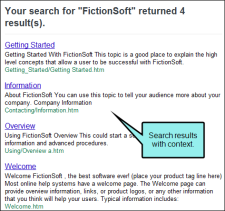 There are additional steps that you can follow and features you can select, depending on the search engine you choose. For MadCap Search and Elasticsearch, you can include micro content in the output, which can especially enhance your search results.See Setting Up a Search Engine. 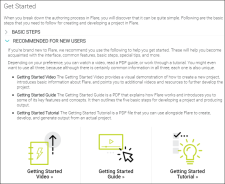 There are benefits to any of the search methods offered by Flare. Some users might prefer the search results returned by Google. However, others might prefer the results returned by MadCap. Or some users might want all of the configurable options provided by Elasticsearch. 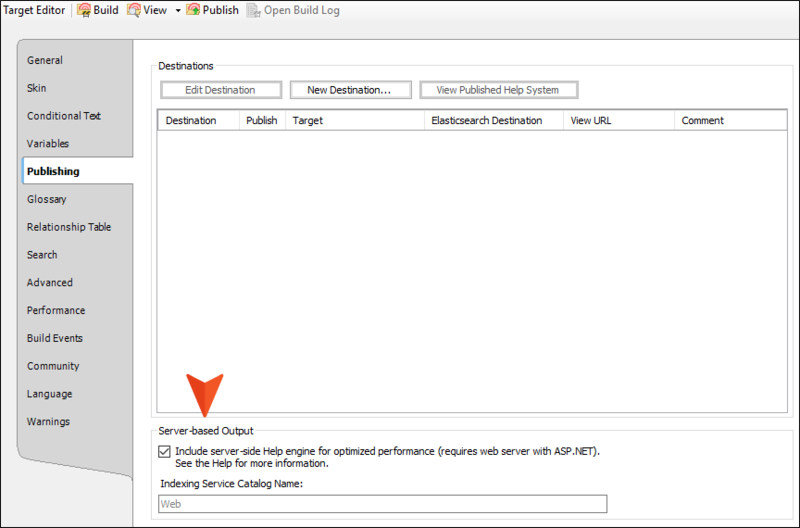 Setting up Elasticsearch is done within the Target Editor and Destination Editor in Flare. Web servers also need to be configured to support Flare, along with the Elasticsearch service. Setting up a Google custom search engine (CSE) and performing other necessary tasks requires a combination of steps in both Google and Flare. This can take a bit of time to complete. However, it is usually just a one-time setup. Setting up MadCap Search in a Flare project takes only a few seconds. Output must be published on a server in order to use the full capability of Elasticsearch. Output must be available publicly so that you can use Google. Output cannot be behind a firewall. Output can be searched whether it is available publicly or locally. You can manage multiple HTML5 targets that use Elasticsearch through the Content Services Portal. See Content Services Portal. You can add multiple folders/sites to be included in your Google custom search engine (CSE). Each of these sites can be a separately published Flare output. 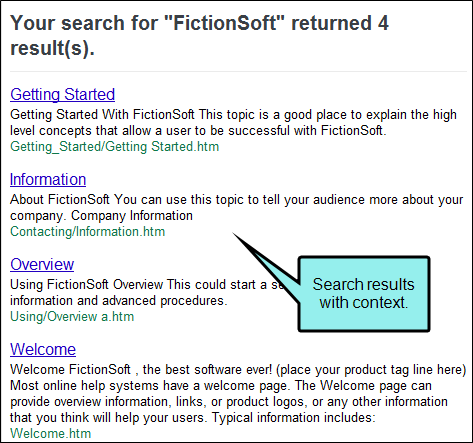 When users search from one of the published Flare outputs, results will display for all of the outputs. Searches will include results for only the Flare output that is open. Most file types are included in the search results. If you have added other types of files (e.g., PDF) to the site(s) associated with your CSE, they may be included in search results. In order to include file types such as PDF in your search results, you need to generate and publish server-based output. See Enabling HTML5 Server-based Output. Elasticsearch does not provide any direct mapping of search criteria to the structure of a Flare project. Google does not recognize the unique characteristics of a Flare project (e.g., index keywords, glossaries). Therefore, those elements will have no effect on how Google ranks pages in the results. MadCap Search rankings are specifically tailored for Flare users. They take into account not only H1-H6 headings, but also index keywords, glossary terms, etc. See Ranking Search Results. Elasticsearch lets you include micro content in your search results, which can especially improve the experience for users. See About Micro Content. Google does not include micro content (created in Flare) in your search results. 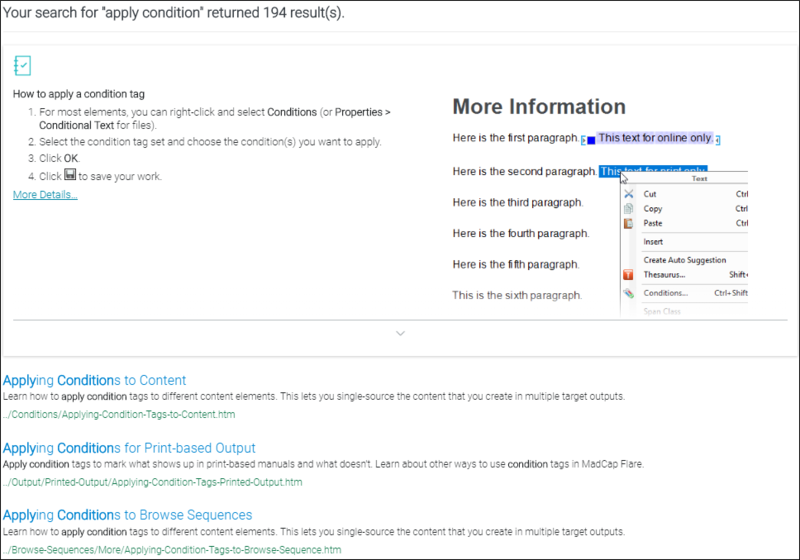 MadCap Search lets you include micro content in your search results, which can especially improve the experience for users. 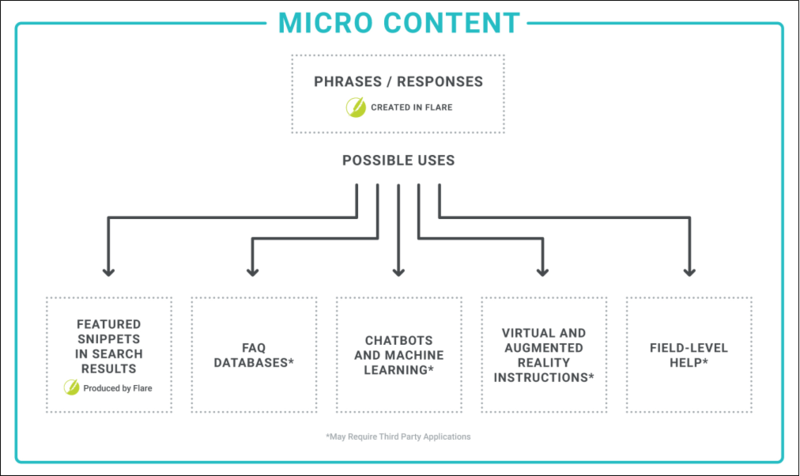 See About Micro Content. Elasticsearch does not provide an option to include glossary terms in your search results. Google will not fetch your project’s glossary terms and feature them at the top of search results. 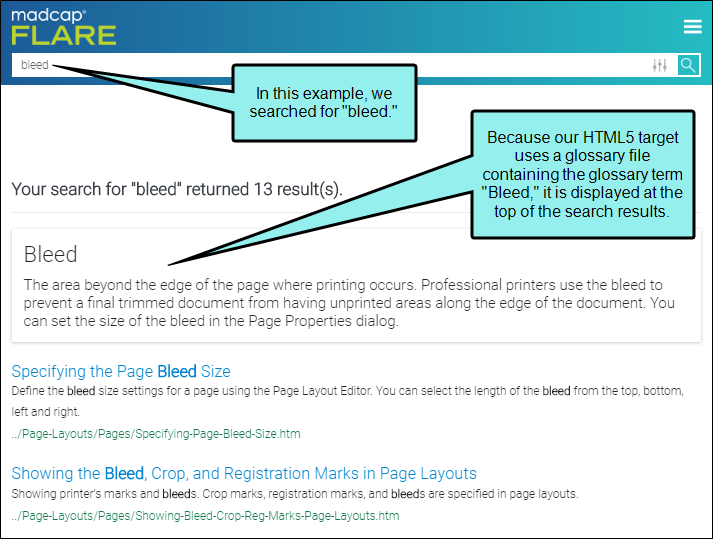 MadCap Search will fetch your project’s glossary terms and feature them at the top of search results. The partial-word search and fuzzy match settings allow for numerous searches to be returned when these settings are enabled. See Enabling Partial-Word Search and Enabling Elasticsearch Through the Target Editor. If an end user incorrectly enters a search term (e.g., types “Tble” instead of “Table”), Google will often guess the correct term and show results anyway. Incorrectly typed search terms will not return results. The administrator portal allows for the search indexes to be managed closely. This will assist in keeping search result times optimal. Search results might lag at times, depending on the size of the output and whether Google is finished with the indexing (i.e., making your output available for searches). Google will index your pages automatically over time, but it can take awhile, sometimes weeks. You can use some of the steps below to help speed up this process. Search results might be faster because the output is immediately indexed once it is generated. You do not need to spend any extra time indexing your pages or waiting for search results to appear. Search results always come from a server, so you do not need to be concerned about the ability of the mobile device to handle the information. Search results are “chunked” and then collapsed so that they can be displayed when a search is performed. This is usually okay on PCs, but if you try to perform a search on a mobile device, the results might be slow or even crash because the device cannot handle the number of search results. No advertisements are included in search results. Users might see advertisements in search results. You can enable multiple options to include a mix of personal and global searches on your output. There is also an option to include project content information such as topic titles and the file path in your project. While Google Search does provide auto-complete results, it does not provide the ability to customize these results. There are no options available for auto-complete results. There are multiple options that allow you to obtain predictive results when searching, especially when using auto-complete options. Google Search provides a measure of predictive results, although it is not customizable within Flare. MadCap Search does not offer any predictive methods in obtaining search results. Searching of Non-XHTML Content When end users perform a search in your online output, you can ensure that non-XHTML files (e.g. PDF, DOC, XLS) are included in that search. 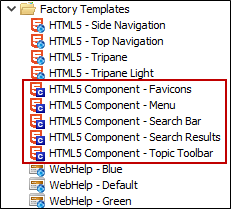 When you build HTML5 output, a subfolder named "AutoSearch" is created and placed in the generated output folder. You can place non-XHTML files within the published AutoSearch subfolder (whether the non-XHTML files are linked to content from your Flare project or not). When users perform a search, those non-XHTML files will also be accessible to the users. 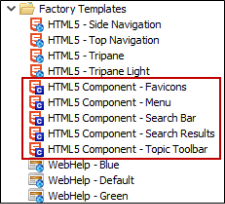 See Including Non-XHTML Files in HTML5 Search. Automatic Runtime Merging of Flare Projects This is an easy way to merge the output from multiple HTML5 server-based Flare targets into one Help system. These targets can be originated from the same Flare project or from different Flare projects. You simply place the output files in the correct location on the server (i.e., within your master project's AutoMerge folder). 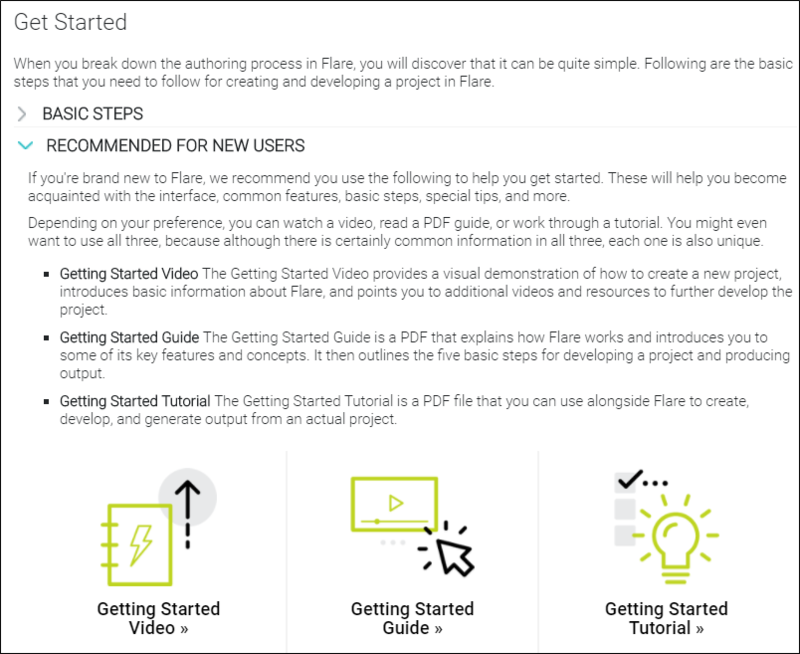 Flare then automatically merges the output from all of the targets when users access the Help. 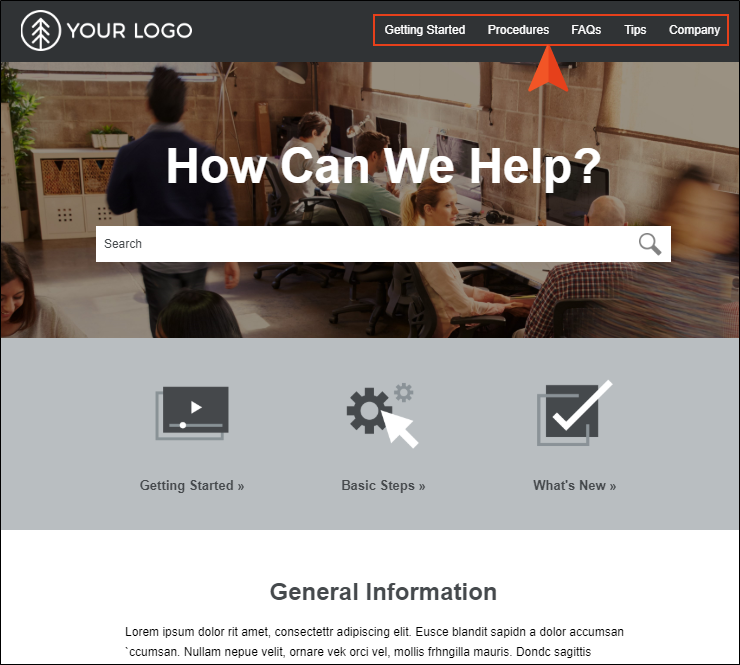 From the end user's perspective, the results are seamless, appearing as one large Help system. All of the TOCs, browse sequences, indexes, glossaries, and search capabilities for the projects are merged. See Runtime Merging Server-based HTML5 Output. Note: The following browsers support HTML5: Internet Explorer 8 or later, Firefox 10 or later, Google Chrome 13 or later, and other browsers that support the HTML5 standard. 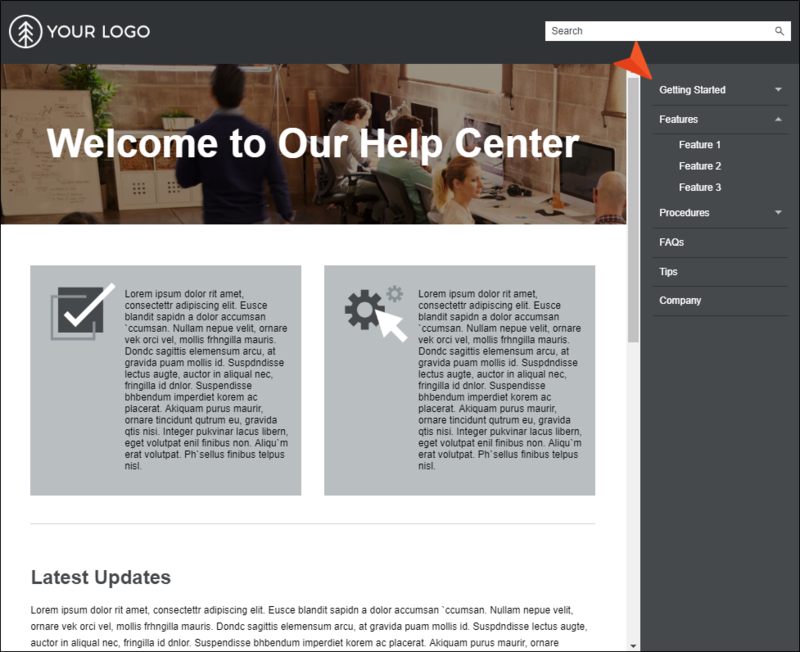 Following is a comparison of the HTML5 Side Navigation, Top Navigation, and Tripane skins, as well as the skinless option.